If you haven’t already figured it out by now, this first one was for the Next Generation Season One special issue, published in April 2002. The first step was for me to create a rough draft of the image I had in mind; it was then sent to the editors who had their art department do a mock-up of the cover to see how it worked and where the cover graphics would interfere with the image. 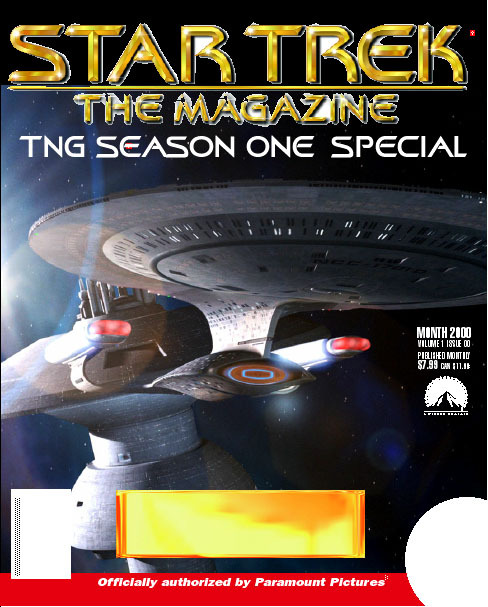 The second cover was for the special Wrath of Khan issue, published in September 2002. For this one I had two basic concepts and offered the editors a variation on each. The first was a combat shot, loosely based on a scene from the film. 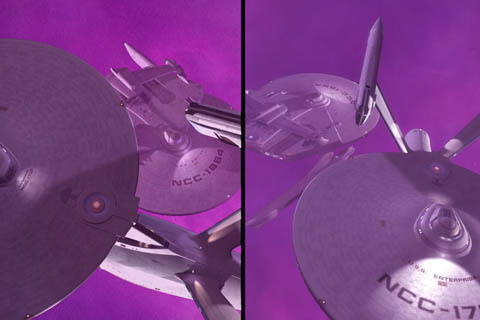 The image on the right is more traditional, while the left side sports a more dynamic pose for the Enterprise (this is the same model that was seen in the Director’s Edition DVD of Star Trek: The Motion Picture). Also note the extra space left on top for the Magazine title. The second concept (below) are two variations on the “cat and mouse” section of the film. As much as I liked the less obvious “artsy fartsy” cat-and-mouse renders, the publishers went for the more dynamic, eye-catching battle concept (as seen in the original mock-up on right). Have you noticed the nerd alert mistake in the picture? Go on, have a closer look… there is a really obvious boo-boo in this image, and if you haven’t figured it out yet you’re going to hit yourself on the head and shout “duh!” when I tell you. Give up? It’s the phasers! Phaser weapons didn’t work in the Mutara nebula, so the ships had to use photon torpedoes during the battle. Luckily, my pal Daren, who was lending his critical eye to the image, spotted the gaff in time for me to correct it before the magazine went to press. Would you have been the first one to write in and tell the publishers of their blunder? Let us know in the comments if you really, truly figured it out before we told you! Here’s full res render (1920×1200), handily reworked for the horizontal world we live in. Feel free to beam it down, print it out and sleep with it! Fantastic. I love digital E’s! Nice website; I always love seeing stuff from the inside of the industry (Starlog #7 got me started). I found out about your website from a post over on http://www.foundation3d.com. I’m going to have to find a copy of the Wrath of Khan because I distinctly remember both ships firing phasers in the nebula. They just weren’t hitting each other because their targetting sensors weren’t working (the torps weren’t hitting either). Then when Checkov makes the Mk 1 Eyeball shot and blows off the Reliant’s warp drive, I remember that as a combination of phaser and torpedo fire. But then, my memory fades as it’s been maybe 20 years since I saw that film, so as I said, I’ll have to dig up a copy of it and watch it again. Again, nice site, love the new BSG (the basestar design is total garbage though) and congrats on getting an Emmy. 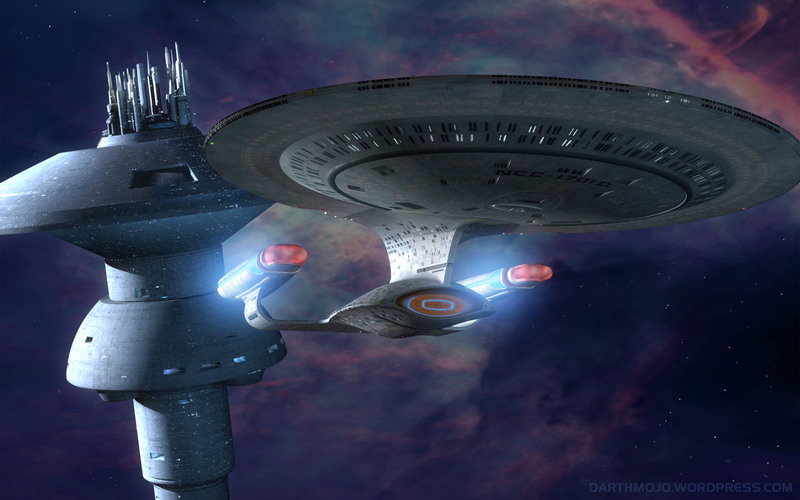 And that is an awesome, awesome shot of the TOS Enterprise… why can’t _that_ be what TOS-R looks like? Beautiful pics, but I have to outgeek you and point out that phasers worked fine in the nebula. They were just having a real hard time hitting anything. I could be well imagining this. But. . . . . . . the phasers did work in the nebula. There’s the scene when Sulu (spelling) manually attempts a shot but is jolted by a bit of “turbulence” and appears to miss Khan’s ship as a result. Tactical and shields didn’t work and they couldn’t get a weapons lock, hence the manual firing. Did pick the phasers but I thought it was because in the movie they were represented much more pulsed in nature rather than as a steady(ish) stream. Anyway, the renders look really cool as always – thanks for sharing. Sorry, guys, but I think you may be incorrect on phasers in the Mutara Nebula. Saavik only said that shields and visual would be inoperable. Sulu later said phaser lock wouldn’t work. Later on, when Khan did a 180, he fired phasers, eating up the torpedo bay, and Kirk responded in kind by firing the port underside phaser bank. This was all in the nebula. I forgot to say “Thanks” for the nice, big pictures. They’re just the kind of thing I love seeing. This reminds me — Mojo, have you seen TOS-R and what’s your take on the CGI there? 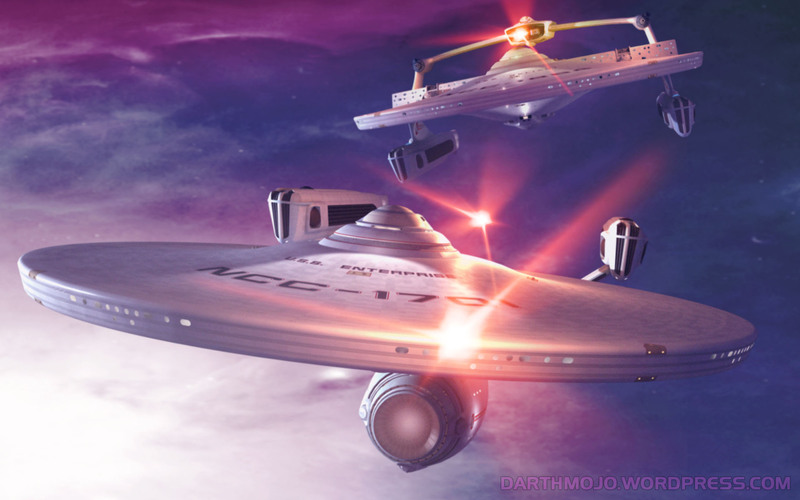 I’m not sure I was the one that corrected Mojo on the phasers thing… since yes, sulu uses them in the nebula… or maybe I mentioned the blue deflector light being needed… I don’t really remember… but I do like the renderings a lot. These are beautiful, thanks for posting! I’m not sure if I should be proud or ashamed that I got the phasers-in-the-nebula thing wrong. In that case, I can’t remember why it was switched from phasers to photons! Torpedoes are prettier? Nice work Mojo. I have collected all the issues of the Star Trek Magazine and seeing your work in it makes it all the better. I look forward to more goodies. Gorgeous images, Mojo. I have a full collection of Star Trek The Magazine as well. I was quite disappointed when it went out of print. Thanks for sharing these images with us. Lower foward phasers shatter much of Reliant’s port nacelle. Reliant fires her phaser cannons and damages the port Enterprise photon torpedo launcher. 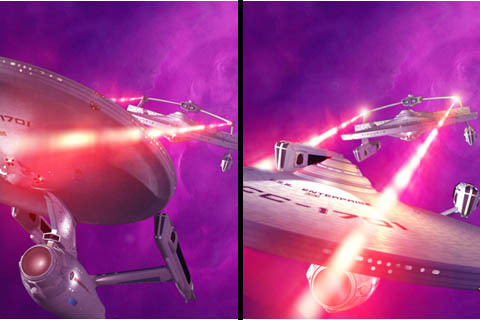 Just keep in mind photon torpedoes do a helluva lot more damage…so changing them makes the shot more “menacing”. The only “error” I see is that the rendered phaser cannons do not look anything like they do in the film (the torpedoes do). You rendered them as 1978 BSG style laser bolts, where they are more of a solid beam with a “hot” arrow tip. Gorgeous, beautiful renders. And just when I was in need of a new desktop background. I must let loose my inner geek and repeat the “no phasers in the nebula” indignation, however. It’s only phaser lock that wasn’t working; phasers worked all too well, as the poor chap in the Enterprise torpedo room discovered. The only real error I see is that the Enterprise doesn’t seem to have any of the battle damage that she had already incurred by the time of the nebula battle. Perhaps it is simply covered by the angle from which we are seeing her. Great Gonzo, those are GORGEOUS. Thanks for my new desktop(s) — lee’s see some BSG stuff in this resolution! Great work! Thank you for sharing it with us! That’s some really top notch work! I’ve enjoyed your work posted here and trekmovie.com. Can you please share what software you use to model and then render with? I do work in design and use different software for modeling and rendering, but it’s always an interest to understand how the texturing is done on the hull plating and so on for film type work. I gather it’s not Maya but something else? Lightwave? Thanks for any info you can share. Man, there renders are beautiful! Especially the TOS 1701 above the Shore Leave planet! Is there a way to obtain this mesh? It’s the most accurate Enterprise mesh I have ever seen! Yeah, the real error is the battle damage is missing. I’d say they used torpedoes as much as they did because the TWoK effects for the photons was one of the best effects in all of Trekdom. And overloaded photon torpedoes do mad damage at point blank range. DAVE: It’s not a mesh, it’s a MODEL. That’s how you can tell the difference between computer nerds and film nerds. Thank you for posting the renders. They are absolutely wonderful! I am familiar with Ed Giddings’ work but I thought, for one reason or another, that Fabio P. modeled the Reliant for the magazine cover. Why are some people’s posts a different color? Having Mojo’s highlighted light gray makes sense, but why are some (like 13 and 19 above) darker than the rest? Nah, all we have to do is render it down to a smaller size, employ less colors, and display it on our JPEG viewer (JPX, JPY, or JPZ versions). :-) Beautiful pics! … wasn’t it NCC-1701-A by that point? No. 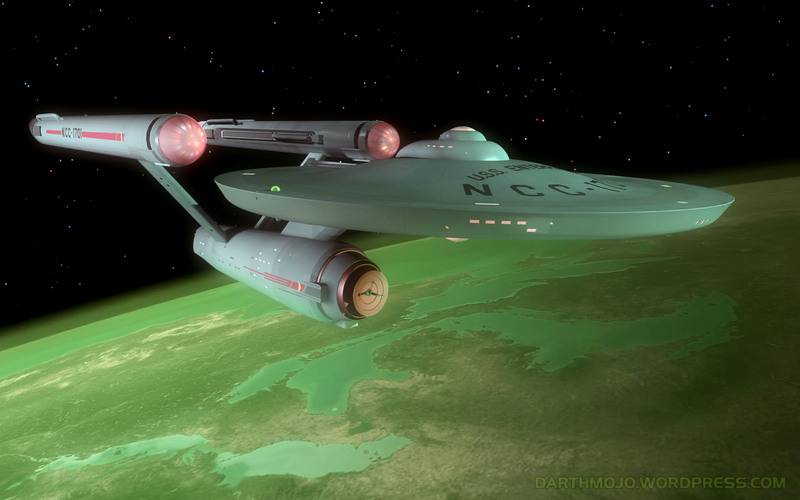 NCC-1701-A came only after the 1701 was destroyed in a later movie…was it The Search for Spock….? Those look awesome! Do you sell prints of those? Great job! I do not sell prints. Only merchants who are officially licensed and authorized by Paramount Pictures may sell Star Trek prints/posters. However, if someone licensed in this area were to contact me, I like to think there are always… possibilities. Sweet ! Nice page ! However I have some qualms about the TWOK gaffe you mentioned. I haven’t seen the film in a while, but the only technical problems I remember them having to contend with in the Mutara Nebula are the lack of shields and the lack of a tactical display. However the phasers DID work, but it was phaser lock that was inoperable. Remember , Kirk said to Sulu, “Best guess..” and of course Sulu misses by a mile, which is why I think that torpedoes were the weapon of choice. 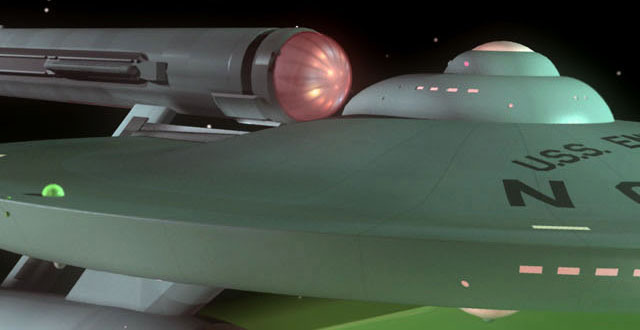 Also note that, in addition to torpedoes, there is a shot of phasers being used to destroy that nacelle on the Reliant at the end. Found your link in a cross link to our site and had to check it out. I remember the magazine and I remeber seeing the Reliant from Fabio at the time. Great stuff, I still have a few extra copies of the Wrath of Khan issue.